To serve others by caring for the health of the South Puget Sound community. 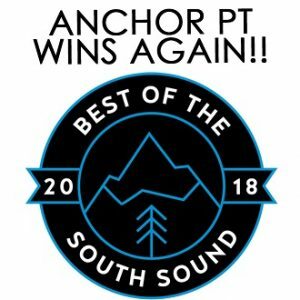 Anchor Physical Therapy first opened its doors in 2008, offering both outpatient physical therapy and massage therapy to the South Sound community. Our top priority is to give each and every patient quality one-on-one care. Our evidence based treatments are individually designed to meet the needs of each patient. Recognizing that every person’s body is unique, we tailor your treatment to your specific needs and problems rather than using the same treatment approach for all diagnoses. By doing so, we will get you great results. The staff at Anchor Physical Therapy strives to bring the best out of each and every patient by working with them to achieve their treatment goals. Using applied science and years of experience, Anchor Physical Therapy offers the highest quality of care available in the South Puget Sound region. Whether it’s getting back to work or back into the garden, our priority is to rehabilitate every patient as quickly as possible. Both locations now accepting new patients. Most patients seen within 24-48 hours.